The second edition - in full colour - is updated and expanded throughout, with a new chapter on all aspects of racing a Locost, sections on improving handling, information on how to get through the Single Vehicle Approval test, and builders' own stories. 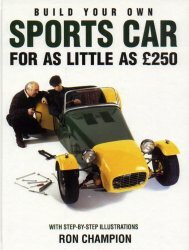 The all-colour practical "Build Your Own Sports Car" provides all the information needed to build a road-going two-seater, open-top sports car on a budget, using standard tools, basic skills and low-cost materials. The down-to-earth text clearly explains each step along the road to producing a well-engineered, high-performance sports car, providing a learning experience in engineering and design - and opening up a whole new world of fun motoring. The Haynes Roadster, which has fully independent rear suspension, has been designed with the aid of CAD software to develop the chassis and suspension, resulting in a car with performance and handling to challenge many established kit cars and mainstream sports cars. The design is intended to make use of components sourced primarily from a Ford Sierra donor, although alternative donors are mentioned. A couple of words of caution, if built to the book plans and dimensions you will need to 'shorten' the Sierra drive shafts, and the Locost SA bodywork does not fit this chassis.